Home MMA News Breaking News: Ben Askren Vs Robbie Lawler Official For UFC 233! Breaking News: Ben Askren Vs Robbie Lawler Official For UFC 233! 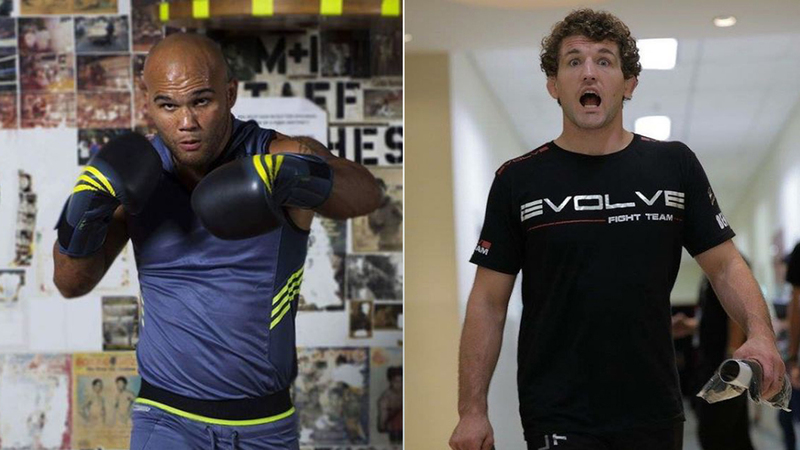 Ben Askren Will Make UFC Debut At UFC 233 On January 26th Versus Robbie Lawler! Ben Askren joined UFC last month as a part of one of the most historical trade between UFC and ONE FC, in exchange for Demetrious Johnson. One month later, his first UFC fight is officially set. Ben Askren will fight Robbie Lawler at UFC 233, on January 26, 2019, in Honda Center, Anaheim, California. UFC announced it on Twitter earlier today. @Ruthless_RL welcomes @BenAskren to the Octagon at #UFC233 in Anaheim! Ben Askren has already challenged many fighters in social media. His most notable victims were Colby Covington, Darren Till, and Jorge Masvidal. But he had no beef with Robbie Lawler at all! Ben Askren has never been defeated – his MMA score is 18 victories and one no-contest. He is the former ONE and Bellator Welterweight champion. He last fought at ONE Championship 64 where he ran Japanese submission specialist Shinya Aoki over via TKO (punches). “Funky” ended the match after only 57 seconds! Robbie Lawler (28-12, 1 NC MMA, 12-6 UFC) is a real MMA veteran. Yet, he had ups and downs in the last three fights. At UFC 201, Tyron Woodley finished him via TKO in the first round. Lawler rebounded back with a decision victory over Donald Cerrone at UFC 214. In his last match, “Ruthless” lost to Rafael dos Anjos via unanimous decision at UFC On Fox 26. This is a typical fight between a striker and a grappler. Ben Askren is the former freestyle wrestling champion of the world! Robbie Lawler is one of the top strikers in UFC Welterweight division! Older fans probably remember his head kick KO versus Bobby Voelker at UFC 157 on February 23, 2013. So, what are your thoughts? Who is going to win? Please share your comments! Previous articleConor McGregor Received Six-Month Driving Ban For Speeding!